A delectably lush and creamy and very easy-to-make amaretto mascarpone cheesecake that’s topped with the very best of the season’s fresh fruit bounty! Please meet my newest sweet treat creation: this wonderfully tart, sweet and boozy Amaretto & Mascarpone Cheesecake. 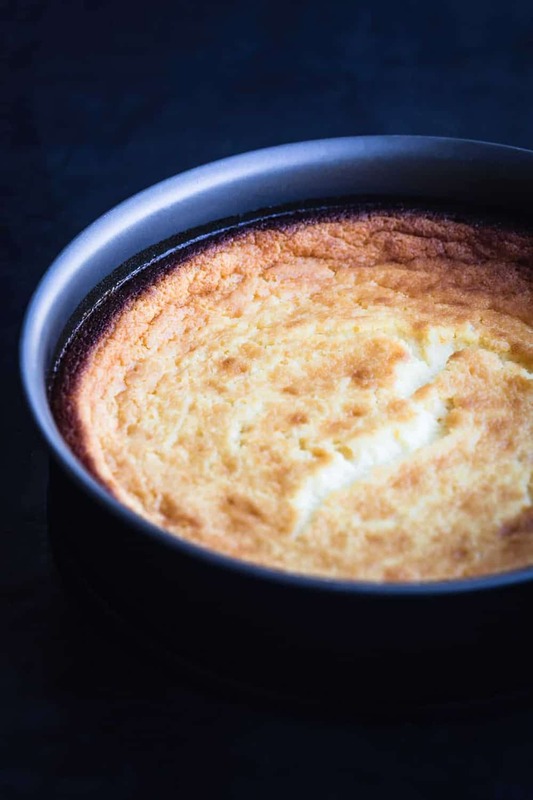 Using a mix of both mascarpone and cream cheese makes this cheesecake taste exceptionally light, which blows my mind cause there’s 5 eggs in there too and really nothing light about it! 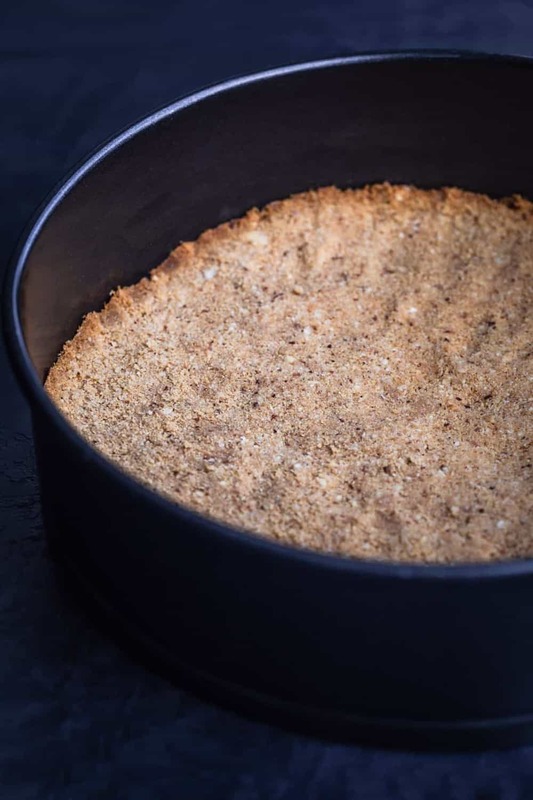 Adding ground almonds to the graham cracker crust adds a nice nutty twist to the classic graham cracker crust. Blind baking the crust sets it and keeps it from getting soggy or shifting when the cheesecake batter is added. Using 2 parts mascarpone to 1 part cream cheese makes for an exceptionally light and creamy filling. Having all the ingredients come to room temp before mixing together ensures that the batter will be silky and smooth. Amaretto liquor, made from a base of apricot kernels and bitter almonds, enhances the flavor of the almonds in the crust and the almond extract in the batter. 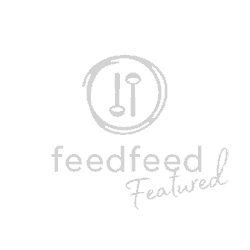 The batter quickly and easily and quickly comes together in a food processor. 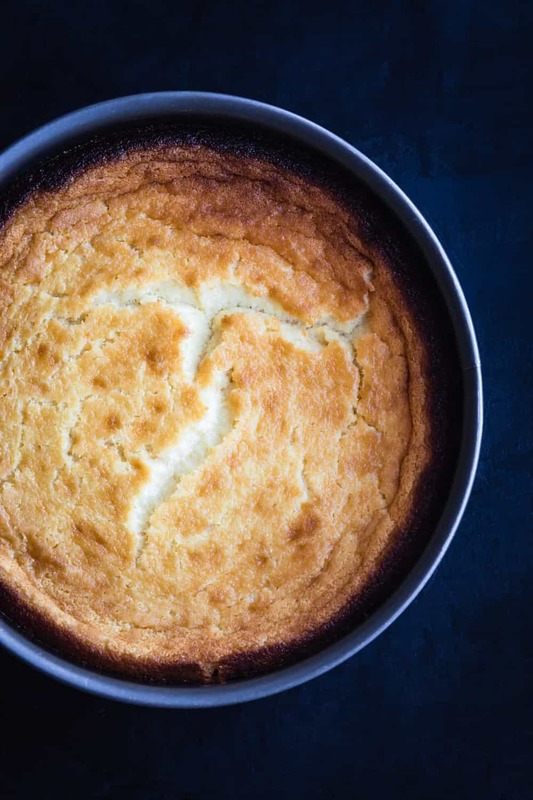 Adding eggs to the batter gives cheesecake its structure and silken texture. The cheesecake is baked directly in the oven, eliminating the hassle to make a water bath. 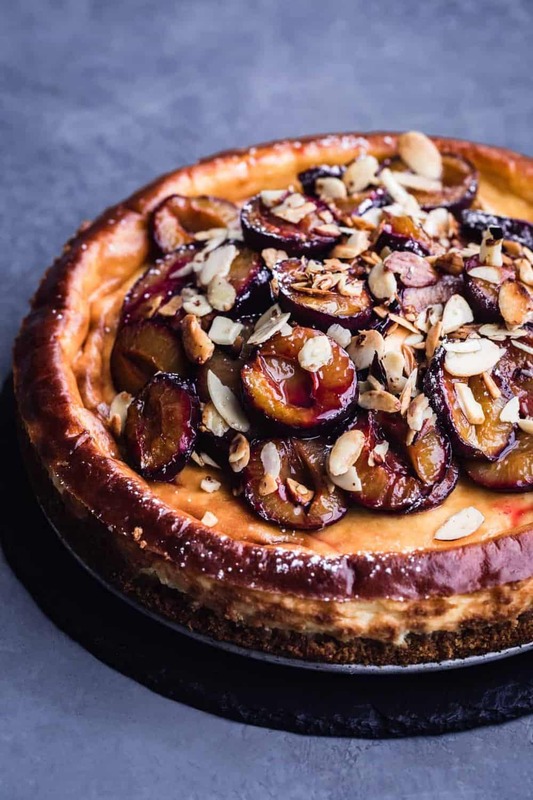 Topping with roasted seasonal fruits makes the cheesecake adaptable to every season so we can enjoy it all year long! Giving the cheesecake time to cool ensures the filling will be sliceable and firm. 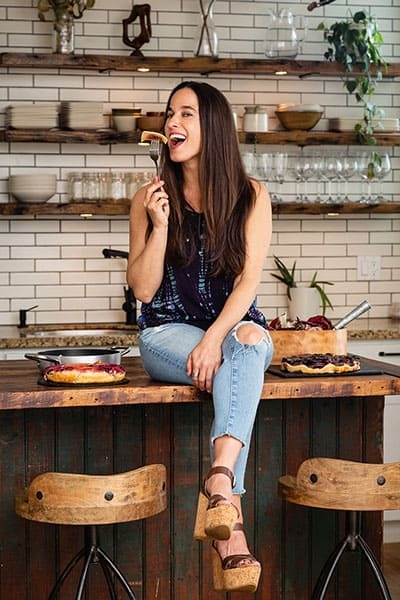 I’m all about playing with seasonal variations and this cheesecake becomes the perfect slightly tangy, sweet, and boozy treat, ready to be topped with so many seasonal possibilities. Make sure your cream cheese, mascarpone, and eggs have time to come to room temp before using (at least 30 minutes out of the fridge). 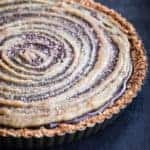 Both the crust and the filling are made in a food processor. 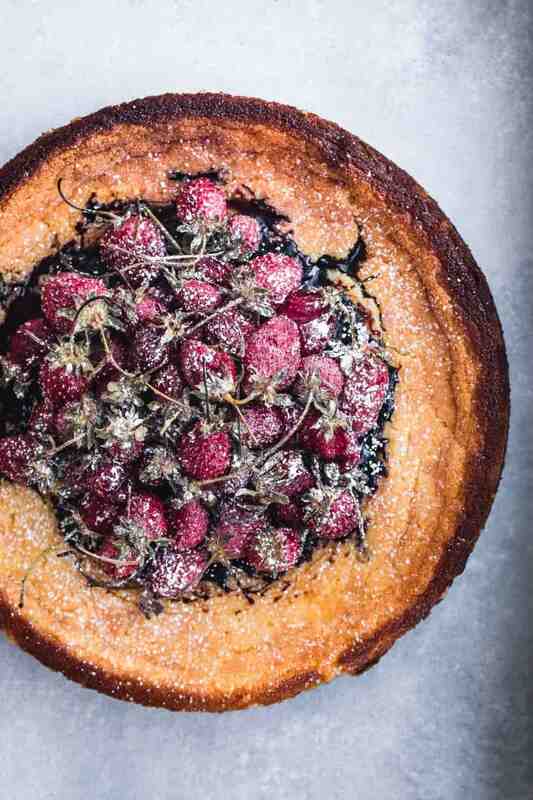 The cheesecake is baked in a springform pan. Let the cheesecake cool completely for clean slicing. Cheesecake is all done and ready to be topped! 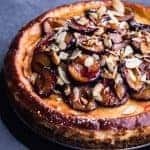 The topping is simply a seasonal fruit, whole, halved or cut up, roasted in the oven for 25 minutes with sugar, water, and amaretto drizzled on top and roasted again for an additional 10 min. In the summer, try stone fruit and berries. In the fall, try apples, figs and pears. In the winter, try candied citrus slices. In the spring, try strawberries and rhubarb. 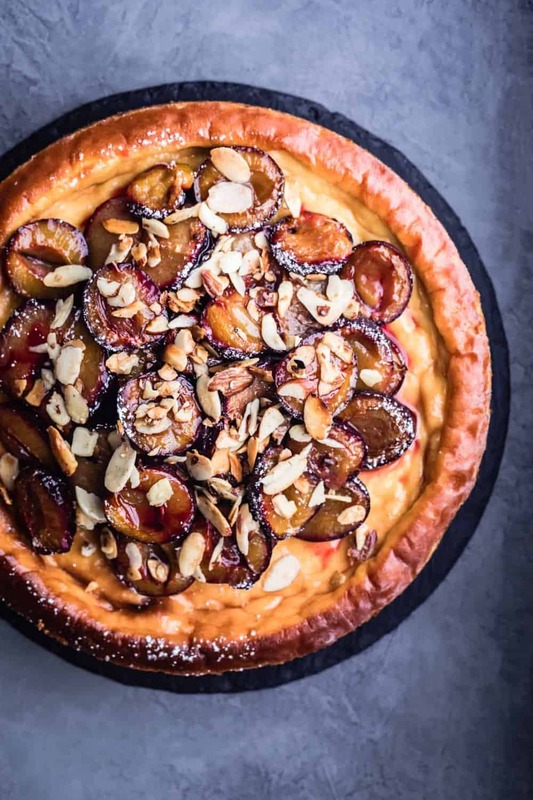 If it’s a fruit, it can be a topping for this cheesecake! It’s crucial that the cream cheese and mascarpone be completely softened, firm cream cheese will not produce a smooth batter. 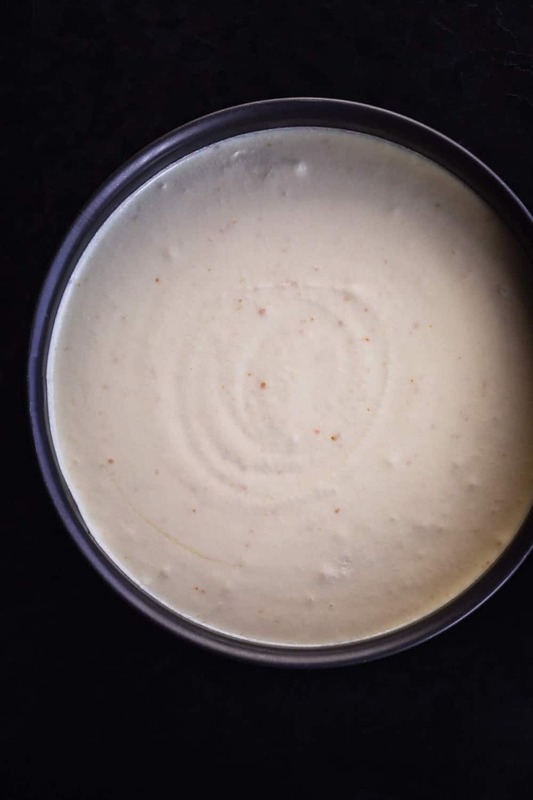 For the clean slicing, let the cheesecake cool completely (at least 3 hours an up to overnight) and slice using a long, thin knife that’s been running under hot water. Wipe knife between cuts. 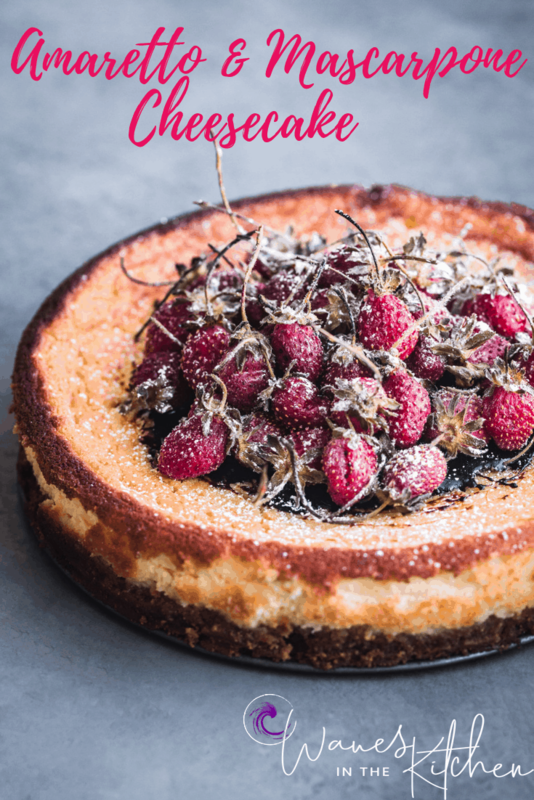 Cheesecake is a classic dessert that can be varied in almost limitless ways! and we shall see what fruit inspiration the upcoming winter season shall bring! This cheesecake is as good to look at as it is to eat! 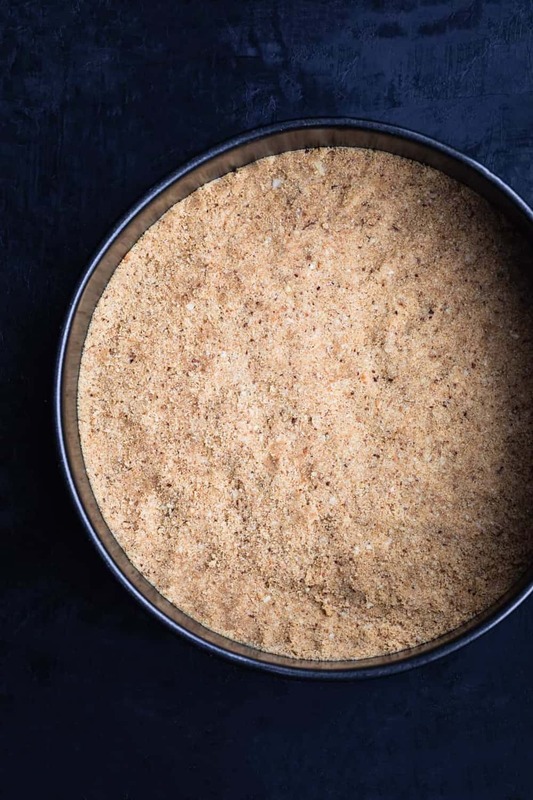 Place the graham crackers in the bowl of a food processor and pulse until small crumbs are beginning to form. Add the almonds, salt and sugar and melted butter and pulse until incorporated. Press the graham cracker almond mixture into the bottom and sides of the spring form pan. Chill the crust in the fridge for 15 minutes, then bake for 10. Allow the crust to cool completely. Lower the oven to 350. 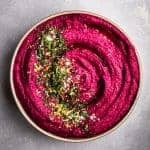 In the bowl of a food processor, combine the mascarpone, cream cheese, Amaretto, vanilla bean (or extract), almond extract, sugar, zest and juice of 1 orange, and a pinch of salt. Run the processor, occasionally scraping down the sides of the bowl with a rubber spatula, then running again, adding slowly adding the eggs and running the until all ingredients are mixed together. Pour the mascarpone mixture over the cooled crust. Bake at 350 for 1 hr and 5-15min. Chill for at least 3 hours or overnight to set. 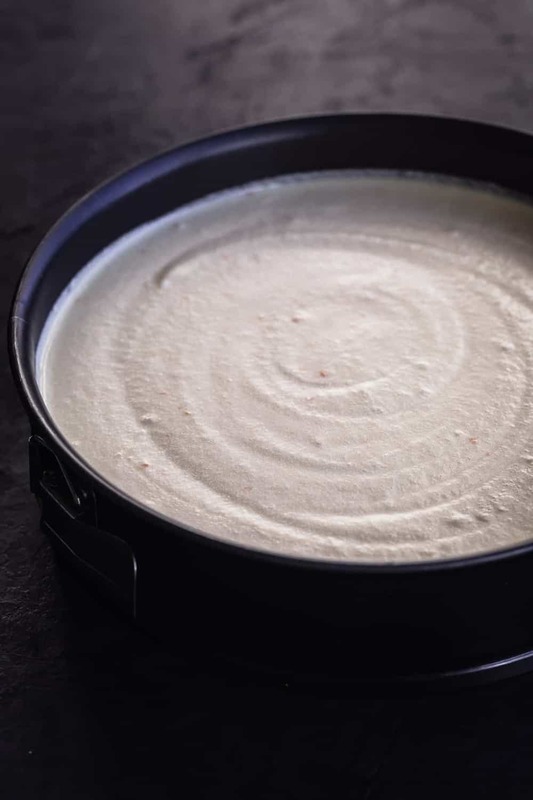 (Cheesecake can be stored, chilled, for up to 3 days). When ready to serve, pre-heat oven to 400 degreese. Spread fruit of choice (so far I’ve used plums, figs, and strawberries and plan to keep on experimenting) cut side up, on tray. Please note I did not cute the strawberries but did with the figs and plums. If using berries no need to cut. Roast for about 25 minutes, or unit fruit is soft. Take out of oven, springle with sugar and drizzle with amaretto and 1 tbsp of water. Bake for an additional 10 minutes. Remove from oven and set fruit aside until cool enough to handle. When fruit is cool enough to handle, spoon mixture over the center of the cheesecake. Sprinkle with 1 tbsp of sliced, roasted almonds (that you set aside from the crust) and enjoy. Just remembering eating this delicious cake my mouth is mouthwatering ?????? You are too cute!!! That was so fun when I made this for ya :). You ate the fig one! ?? Honey wants to know how to subscribe to your blog! Thank you!!! There’s a sign up bar on the bottom of my homepage :). Let me know if she has any issues. Love and appreciate it! ? You’ve cooked that cheesecake perfectly. It looks so good! I must try it! It looks amazing, Daniela! I can guarantee you that I’m going to be making this soon! I can’t thank you enough for sharing this! Absolute pleasure!!! Thanks so much for the feedback! And please let me know how it comes out when ya make it! And what fruit you choose to top it with :). ? Absolutely gorgeous dessert! Who needs a centerpiece around the holiday when you can have this gorgeous dessert in the middle of your table! Pinned! Thank ya so much!!! Please let me know what you end up topping it with if you make it! So many fun options! Can even add some roasted cranberries to really Holiday it up :). ?❤️? I love cheese and surely this is for me. 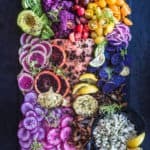 So gorgeous and love the option of seasonal fruits to it. Everything in this recipe to super delicious. Wow! This cheesecake looks absolutely delicious! And your photos are stunning too! Thanks so much for the sweet feedback Michelle!!! Love and appreciate it :). Such a gorgeous cheesecake! I love the addition of ground almonds in the graham crust. The fruit toppings are all beautiful, too! Thanks so much Colleen! Yes the almonds add such a delicious touch to the crust! Thanks so much for the feedback ~ really appreciate it :)! What a decadent cheesecake! I love the mascarpone in there…such a stunning dessert. I can’t wait to make this! This amaretto mascarpone cheesecake looks like the dessert I’ve been craving forever. Thank you so much for adding all the need to knows too so that I can make this foolproof recipe. Absolute pleasure!!! So stoked to hear its the dessert you’ve been craving forever :). Please keep me updated if ya make it ~ would love to hear how it goes! You had me at Amaretto! This sounds so decadent. 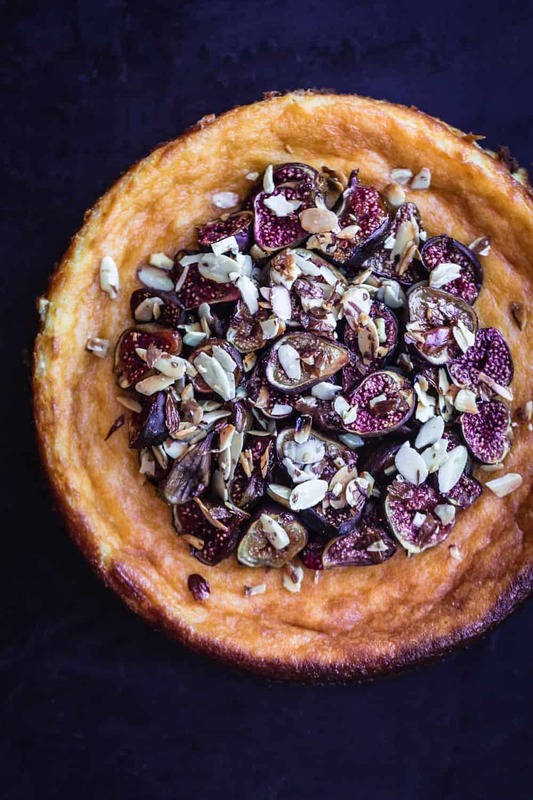 We’re growing figs so I’m saving this recipe for when they’re in season! What a beautiful cheesecake! And I love that you use the roasted vegetables on top. 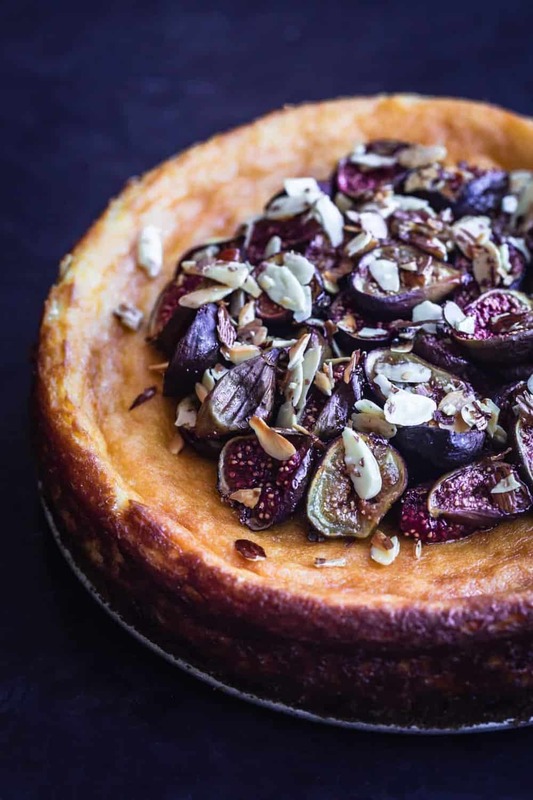 A very unique twist, but you are so right that it makes this cheesecake very adaptable to any season. Your photos are great! I love the flavors of the cheesecake. Wow that cheesecake looks amazing!! The flavour combo sounds perfect, will have to attempt to make this one soon. Cheesecakes are my weakness. When I see one, I must immediately have it on my table. 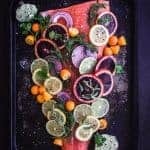 I’m saving this delicious recipe and making it asap. I absolutely love the topping. I bet this taste heavenly good! Made this for Christmas and it was amazing! I’d like to bring to a dinner banquet but need to leave out the amaretto. Any suggestions for a substitute? So super stoked to heat that Shana!!! Thanks so much for the feedback! Are you looking for a non alcoholic substitute? You can also simple leave it out… :).